OGR is an accredited ISO 9001 company with a Quality Management System ensuring consistent and high quality service delivery to our clients. To a view a scan of the certificate click here. The Common Safety Training Programme (CSTP) is an initiative under the banner of the Australian Petroleum Production & Exploration Association (APPEA) with the aim of raising safety standards throughout the Australian Oil and Gas Industry. As such, OGR is now committed to ensure all of our staff are CSTP compliant. The CSTP programme is to be rolled out in July 2013 and it is a requirement under APPEA that we engage all of our staff in the attainment of the CSTP accreditation as soon as practicable. Our policies promote safe and efficient operations ensuring that a focus on safety is maintained in all of our operations and endeavours. We are committed to the health and safety of our employees, subcontractors and clients, offering a safe, hazard-free working environment, to protect employees’ health and company property. It is OGR’s policy to provide a safe, hazard-free working environment, to protect employees’ health and company property, and to promote safe and efficient operations. The possession or consumption of alcohol, illegal drugs or other mood altering substances on company premises or those premises or facilities operated by any of OGR’s clients is strictly prohibited. The possession of firearms, weapons, explosives, ammunition or pornographic material on company premises or those premises or facilities operated by any of OGR’s clients is strictly prohibited by either company employees, subcontractors or other persons. In the interest of safety, security and compliance of the company policy and in accordance with the conditions imposed upon the company by law, regulations and agreements with our clients, the company will maintain guidelines and procedures that will ensure a safe working environment free of unnecessary hazards. It is OGR’s policy that each employee is individually responsible for maintenance of acceptable standards of personal behaviour in the business and operational environment. All employees and subcontractors, and anyone invited on to OGR company premises are to behave and carry out their assigned duties in a business atmosphere that is free from harassment and discrimination. OGR’s company policy encourages and enforces that employees treat each other with mutual respect, courtesy, consideration and professionalism. OGR will not tolerate any form of harassment or discrimination by any employee for any reason. All employees and contractors, at any level of the company, shall not be considered exempt from this policy. Harassment can come from fellow employees, supervisors, managers or clients. Men and women alike can be considered victims of harassment. The company cannot stress strongly enough that it will not tolerate any form of harassment. OGR prohibits not only unlawful harassment, but also unprofessional and discourteous conduct. Accordingly, racial, ethnic, religious, age, sexual orientation, sexual or other inappropriate remarks slurs or jokes will not be tolerated. It is OGR’s policy to conduct its operations in such a manner as to minimise or negate any actions that may have any impact on the environment. The company is aware of the sensitive and ecological balances required between any operations we may conduct and the environment. OGR makes every effort to avoid or minimise pollution that would disturb the environmental balance. OGR, its employees and subcontractors will follow all national guidelines and regulatory standards to prevent pollution or environmental damage to the land, waters or air in which the company may operate. Subcontractors and others who visit or work at any OGR company facilities or locations will be held accountable for ensuring that environmentally proven practices and policy procedures are followed. Environmental pollution violations, incidents or hazards associated as part of this policy should be bought to the immediate attention of management. OGR is an equal opportunity employer and will provide equality in employment for all people employed or seeking employment. Every person will be given a fair and equitable chance to compete for appointment, promotion or transfer, and to pursue their career as effectively as others. In all cases performance and competence are to be used as the basis for performance assessment, training and development opportunities and promotions. Oil & Gas Repair Australia Pty Ltd (OGR) specialises in the recruitment and project placement of maintenance, construction and marine personnel in Western Australia. OGR is committed to establishing and maintaining a Quality Assured management system to control the quality of our management and operational processes to meet and exceed client expectations and requirements of ISO 9001:2015 Quality Management Standard. Continually improving the effectiveness of our Quality Management System hence improving our work practices leading to improved customer relations. Providing tailored and responsive labour hire and recruitment solutions for the oil and gas industry. Establishing measurable quality objectives which are subject to ongoing review and development. Operating to the philosophy that continuous improvement involves all members of the company and always recognising the needs and expectations of our customers. Providing the necessary leadership and resources to achieve our objectives. Stringently complying with all relevant legislation, as well as industry and client specific requirements. This policy applies to OGR employees, contractors and other personnel involved in activities pertaining to OGR activities. OGR is committed to the health and safety of its employees, subcontractors and clients, and will strive to ensure that a focus is maintained on safety in all of our operations and endeavours. The protection and safety of personnel, the environment and company assets are at the core of the company’s primary concerns. There is no operation that is too important to take the time necessary to carry out our business safely. This philosophy enables OGR to deliver the safest and highest quality services to its employees, subcontractors and clients. Therefore, it is OGR’s policy to provide a place of employment which endeavours to reduce or remove as reasonably practicable, recognised hazards, provide incident and accident prevention system and awareness, and comply with applicable national regulations. Recognising that safety hazard awareness and prevention, and environmental protection are corporate functions, all employees and subcontractors at all levels are responsible for the prevention of work place related illness and injuries, property damage and environmental incidents or accidents. OGR is committed to safeguarding its employees and assets and ensuring the continued delivery of its services. All employees are to ensure they comply with government regulations regarding access to ports and offshore facilities. Employees and subcontractors acting on behalf of the company are to be in possession of a Maritime Security Identification Card (MSIC) issued through the Department of Transport and Regional Services. OGR will ensure all employees have made application for their MISC as soon as possible after commencing with the company. Any personnel who are not issued with an MISC due to there being good reason for rejection by the government department will not be permitted to carry out company business on either vessels or offshore facilities. Smoking and passive smoking are recognised worldwide as health hazards. OGR has an objective to provide its staff and contractors with a smoke-free work place where possible. To this end, during hours of business, all OGR shore based offices and establishments are designated as smoke-free environments. In order to maintain an offshore tobacco smoke-free atmosphere all employees, contractors, or any other personnel representing OGR are to adhere to any vessel or facility smoking policy requirements as dictated by offshore policy requirements of companies and operations that OGR supports. All personnel shall receive the instruction and necessary guidance as required for implementation of this policy. Every effort will be made to assist smokers to adapt to working conditions under this policy. Personnel wishing to quit smoking are encouraged to seek advice and assistance from the many government initiatives available to them. 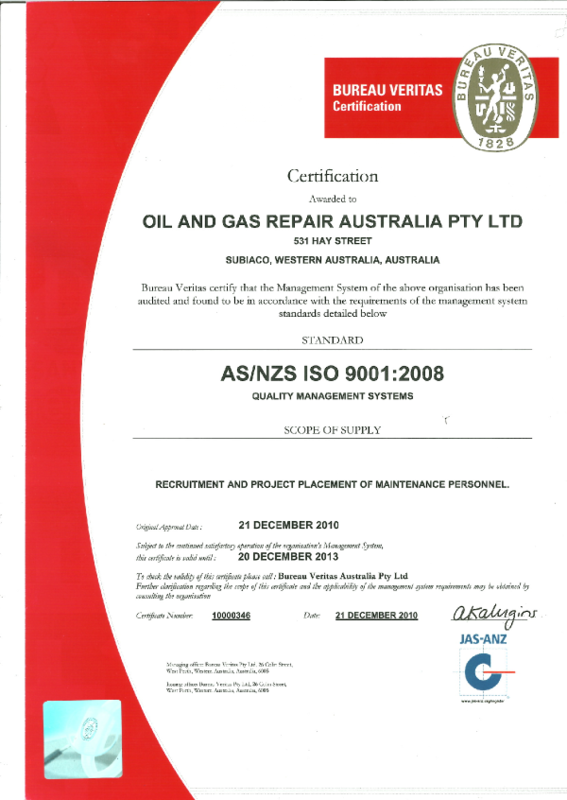 OGR is an accredited ISO 9001 company with a Quality Management System ensuring consistent and high quality service delivery to our clients. To a view a scan of the certificate click here.